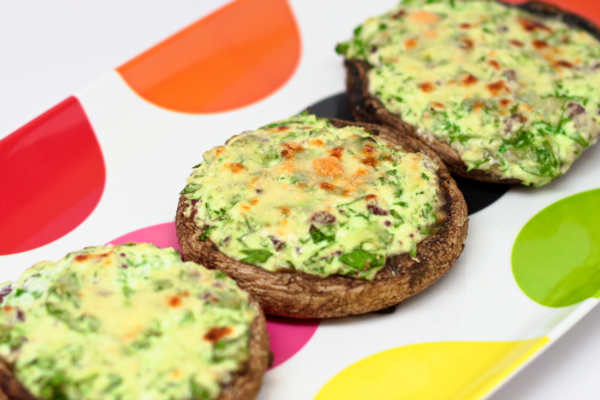 What a beautiful aroma as these cook up in the oven – the cheese and spinach make a perfect stuffing for succulent, meaty Portobello mushrooms. Serve as an appetizer or as a dinner side. Preheat oven to 450 degrees. Spray a baking sheet with Pam and place mushrooms with the gills facing up. Sprinkle with salt and pepper and bake for 20 minutes them take them out and tip each cap to make any juice run out of them. Mix ricotta, spinach, half of the parmesan cheese, olives, herbs, salt and pepper and divide mix among the mushroom caps. Sprinkle the rest of the parmesan on top and then back for another 10 minutes to heat through. Switch to broil and brown the tops just a bit. 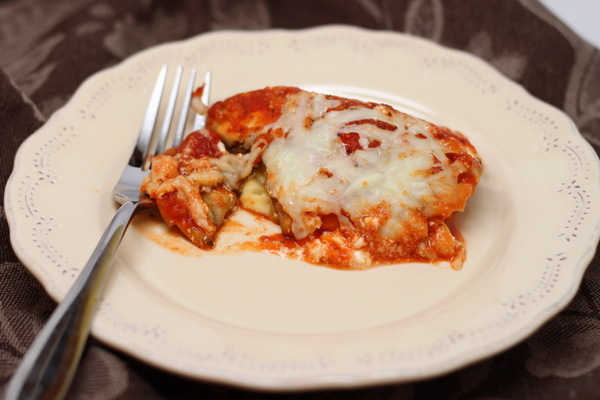 This dish is a cross between lasagna and eggplant rollatini (which is a dish often served as an appetizer and is eggplant rolled up around ricotta cheese and topped with pasta sauce – yum!). In this recipe, instead of rolling it up, I have layered it in a baking dish much like a lasagna would be made. 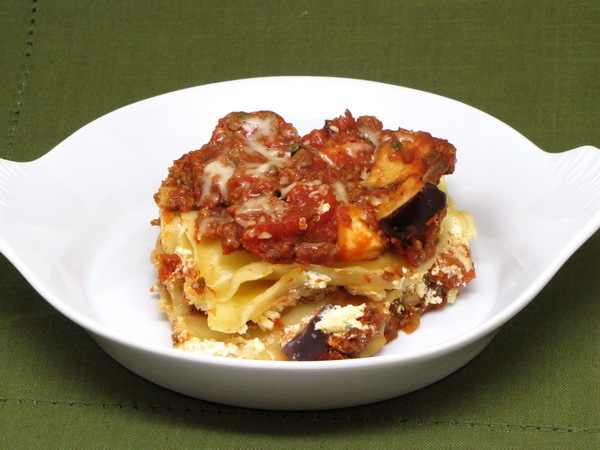 The results – a skinny lasagna full of yummy cheese. Preheat oven to 350 degrees. Spread ½ c or so of sauce in the bottom of a 9×13 baking dish. Mix cottage cheese, ricotta cheese, 2 T parmesan cheese, salt, pepper, garlic powder, basil and parsley. Layer 1/3 of the eggplant slices to fully cover the bottom of the dish. Sprinkle with salt and pepper and then spread half of the cheese mix on top of the eggplant slices. Cover with ¾ c of sauce then layer the next third of eggplant slices to cover the whole dish. Add the rest of the cheese mix and then another ¾ c of sauce. Finally add the last third of the eggplant slices to make the top. Spread the rest of the sauce over the top and then sprinkle with 2 T parmesan cheese. Cover with foil and bake for 45 minutes. Remove cover and spread the mozzarella cheese over the top. Bake another 10 minutes. Remove and cool for 10 minutes before slicing. These are just AMAZING ! Serve as an appetizer, a lunch, even a dinner with a salad next to them. The sundried tomato flavor mixed with the flavor of the cheese and the mushrooms is just outstanding. 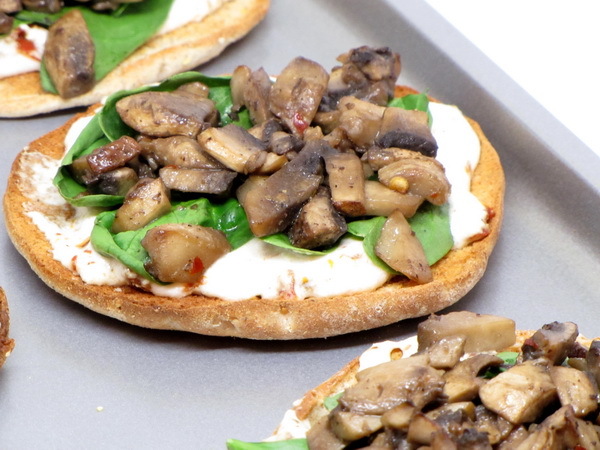 The prep is quick and easy and these are just amazing ! Preheat oven to 350 degrees. Toast rolls in toaster. 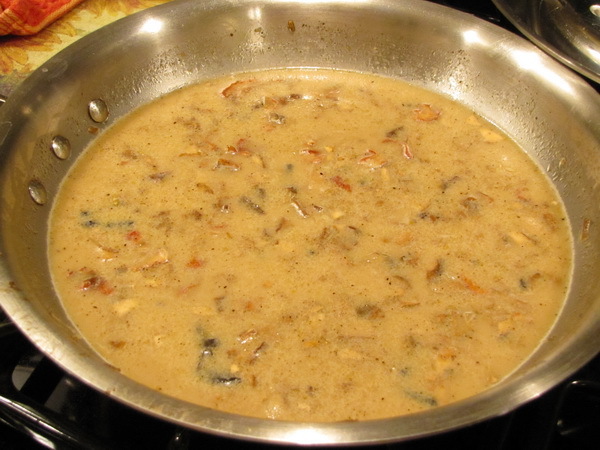 Heat oil in a skillet and cook mushrooms until soft, about 7 minutes. Add salt, pepper, red pepper and garlic powder. Pulse tomatoes in a food processor or chop very finely and stir into ricotta. Add salt and pepper to taste. Spread the cheese mix on the rolls and add spinach leaves. Finally add mushroom mix to the top and bake 5-7 minutes. I modeled this recipe after a restaurant favorite of mine – it is a wild mushroom ravioli appetizer that I could not help but order every time I frequented a certain restaurant, but the calorie count was over the top. Not this one !! Between the RICH cream sauce and the multiple mushroom flavors, this meal tastes just as decadent but with so few calories, you can eat it without any guilt. Thanks to Marxfoods.com for the wild mushrooms to create this masterpiece ! The different varieties lend quite a flavor to this dish. 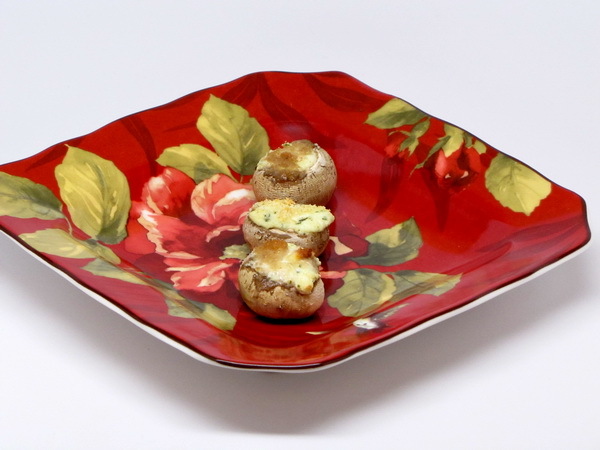 The dish would just not be the same using run of the mill mushrooms. 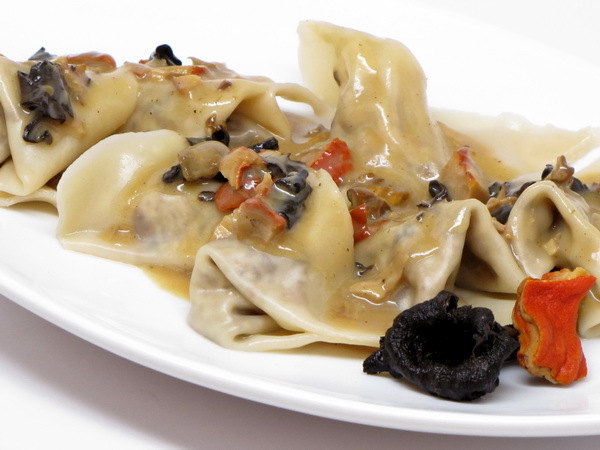 The mixture of the chanterelles and matsutakes inside the little packet of goodness combined with the flavors of the porcini, lobster and black trumpet mushroom sauce … well, it’s just a little bit of heaven right here on earth. Marxfoods offers a bunch of wild mushroom varieties – I think my favorite in this dish were the black trumpet mushrooms – they have a very delicate texture and the aroma is akin to a truffle. These are definitely on my list of favorites. 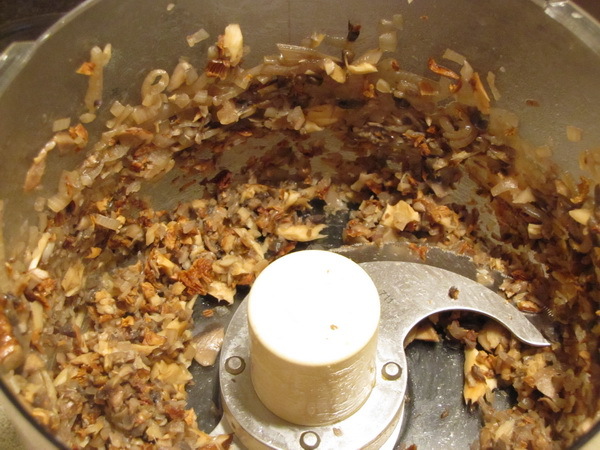 To reconstitute dried wild mushroom, place in a glass bowl and cover with very hot water. Let sit 20-30 minutes. Reserve the water to use as when boiling the wontons. Heat 1 t oil in a skillet and sauté the shallots on medium high heat for 5 minutes. Add 1-2 T of water if needed to keep the shallots moist. Add the reconstituted mushroom and sauté another 2 minutes. Finally add the Portobello mushrooms and sauté another 7 minutes. When done, place all in a food processor and pulse 14 times. 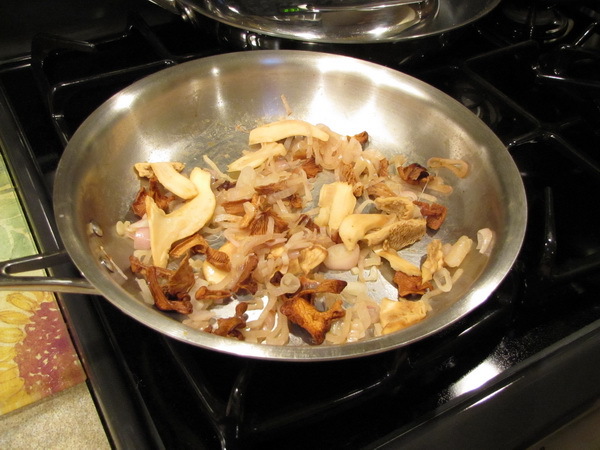 (It’s best to chop or mince the woodier mushrooms like chanterelles and matsutakes). Turn into a bowl and mix with the ricotta. Set aside. Heat 1 t oil in a skillet and sauté the mushrooms 6 minutes. Add up to 1 T of water to keep the mixture moist. Mix starch and broth and add to the pan along with the evaporated milk. Bring to a boil then reduce heat and cook 2 minutes to thicken the sauce. During the last minute of cooking, add the vinegar. Set aside. Put reserved liquid in a pot and add enough water to make 2 quarts. Add salt and bring to a boil. Complete all wontons then boil in 2 batches. 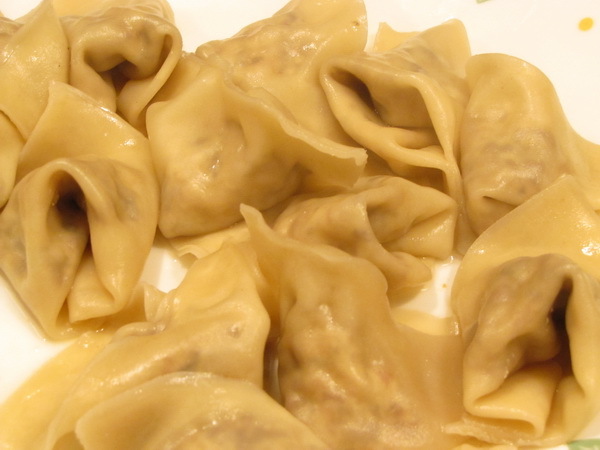 Use a slotted spoon to lift the wontons out of the pot – put on a platter and cover with the sauce. Another installment of stuffed mushrooms ! The pesto flavor really comes through and makes these a success story. Much easier than chopping stems and cooking sausage…these come together very quickly and are a great appetizer, snack, or side dish. Preheat oven to 400 degrees. Spray a baking sheet with Pam. Remove the stems from the mushrooms and place the mushroom caps on the baking sheet with the stem side facing up. Mix the ricotta, pesto and flour. Spoon the mix evenly into the mushroom caps and press down. Combine the parmesan and breadcrumbs and sprinkle on top of the mushrooms. Press down lightly. Bake 15-20 minutes or until browned. 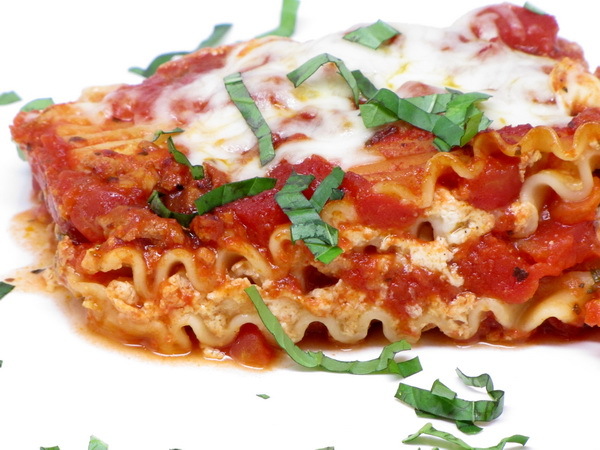 Even traditional lasagna lovers like this one – and it is nice and easy to do. Start it at lunch time and have dinner ready 4 hours later. Take a look at my video below for instructions on how to layer it in your crock. Brown the ground beef in a heated skillet and drain off any fat and water. Stir in the pepper, sauce, onion powder, garlic powder, basil flakes, water, and eggplant. In a bowl combine the egg, cheeses and parsley. Place a layer of meat sauce on the bottom of a crock pot. I find my oval shaped on works the best here. Top with 2-3 noodles, nipping off the corners in order to get a nice fit. Add another layer of meat sauce and then one thick layer of the cheese mixture. Top with a final layer of noodles and then a final layer of meat sauce. Cover and cook on low 3-4 hours.